We have already posted about How to start a Blog on Blogger and the reasons Why one should start up a Blog , In this post I'll be sharing some of the Tips that a new blogger must follow in order to achieve success and take his blog to next level. 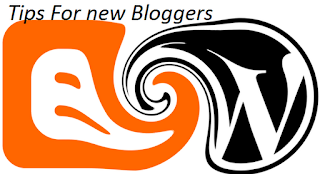 I started blogging around 2 years ago and I have learnt a lot about blogging , though i am still blogging on ".blogspot.com" domain ,that does not matter , the main thing is a Blogger must produce Good quality posts that contains useful Content and help readers. 1. Firstly Choose a Particular Niche like Technology , gadgets , Clothing , Health etc . After choosing a Niche will help you become a master in that particular Niche. Many people who are new in Blogging starts writing random stuff , some posts related to Technology , some related to Sports and many other stuff. Don't ever do this , always stick to one particular theme or Topic of writing and post about that only. 2. After setting up a Blog , Submit it to Alexa , Google analytics and other Search engines. Every blogger tries to get maximum traffic to his/her blog. So a blogger must learn about some SEO to drive traffic to his/ her posts. 3. Stay away from Plagiarism : Many new blogger starts copying articles from reputed Blogs which is a bad activity. Google never likes Plagiarism and penalizes such blogs severely. 4. Drive Traffic from Social Sites : There are a lot of Social networking and Social bookmarking websites that a blogger must use to get traffic. A blogger must submit his post to Digg and Stumbleupon , this practice from the beginning will help a blog to a lot extent. You can learn about Top Social-networking and Social Bookmarking Websites here. 5. Make money from Your Blog , Don't make Blog For Money : Many new bloggers dreams of earning Dollars from the first day of starting up a blog... Well Blogging involves patience and a New Blogger must concentrate on producing Quality Content realted to his niche , Drive Traffic and then lastly think about monetizing his content. Well in the first year of my Blogging Career , I didn't earned a single cent but once traffic starts coming , you can choose any Advertising program to earn out of your blog. 6. Find a community or Group of bloggers with similar Interests : Search for Bloggers with similar interests and actively take part in Commenting and sharing problems & issues related to your Blog.Such Groups helps a lot ,I have been actively involved in couple of Groups related to Blogging on facebook that consists of many expert bloggers that can help solving your problems and i must say they are very Useful. 7. Don'T Use third party Widgets on your Blog: Such kind of widgets like reduces the Page loading speed of your page and Google never ranks such blog in top position. 8. Concentrate on Quality rather than Quantity : A new blogger must concentrate on Producing Quality content rather than writing bunch of useless articles everyday. The concept is simple : Write Good and Useful content , that will Give your Blog a Good reputation & Google will place you higher in SERP's that will ultimately help you getting more amount of traffic in your Blog. When you have Traffic , you can think about monetizing your site or Blog . The whole Concepts seems to be very much simple though very hard to implement it. That's all we have for new bloggers , I hope it will definitely help you if you try to implement all the advices and Tips mentioned above. Stay updated : Subscribe to our feeds and Like Us on Facebook to remain Updated .